For the second straight week, the Boone Central Cardinals were on the wrong side of the final tick of the clock. One week after a potential game-winning halfcourt shot was released just after the final buzzer by the Cards, visiting Central City burned BC with a deciding lay-up that dropped through the net as time expired Thursday. 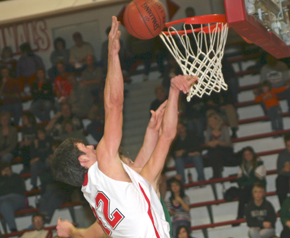 That dramatic shot by Ben Clausen ended a see-saw affair with the Bison on top 47-45. “A slow start and strong finish is the best way to sum up this game,” commented Boone Central Coach Dan Zoucha. “We were not satisfied with our defensive effort in the first half. We allowed Central City some easy looks at the basket and got in an early hole. “Our effort in the second half is what we should expect from ourselves. We communicated better on both ends of the floor and were able to take a late lead. Our effort for one half was good and our rebounding was good. We need to put together a full game and be more consistent with our shooting.” Boone Central outrebounded Central City 34-23, but struggled from the field (18-of-45) and foul line (4-of-14). Kunzman led BC with 12 points. Points were again hard to come by Friday at Pierce. Boone Central scored just 14 points in the first half and dropped a 44-35 decision to the Bluejays. “We believe our defensive effort was better against Pierce, although we still had some defensive possessions where we got out of position and allowed them looks at the basket,” noted Zoucha. “We did not shoot well from the floor or foul line once again and we will need to take care of this. Pierce, on the other hand, did shoot well. Boone Central never did find its shooting touch Friday, hitting just 11-of-29 two-point attempts, 2-of-12 three-point tries and 7-of-16 free throws. Pierce had a huge advantage at the charity stripe, sinking 23-of-32 attempts. Julian Kunzman again led Cardinal scorers with 10 points.